I’d like to thank my husband Mike – AKA Mr Magpie- for the inspiration for this recipe. Mike doesn’t really like zucchini unless it’s baked into a sweet treat (uh, don’t we all?) and I had to really think outside the box for this recipe. What could I make that would “hide” the zucchini for Mike yet not be entirely unhealthy, use some great spices and make up for the squishy texture that he doesn’t really like? These Cheesy & Crunchy Tex-Mex Zucchini Sticks, that’s what. I love that they aren’t too horrible for you, indeed the only fat comes from the cheese and you can most certainly use low-fat! I didn’t want to use oil, even olive oil, because I wanted them to be a little lighter than the usual baked zucchini that’s coated with oil. The tex mex seasoning is not something that many people – if any- put on their zucchini. 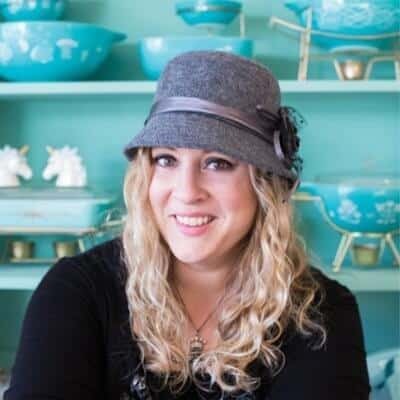 I’m hoping this recipe changes their minds! It’s spicy, crispy, delicious, oil-free and cheesy! Now, while I did melt Havarti cheese over half of the zucchini sticks, I actually preferred the one without the cheese that you can see in the background of the photo! I can’t believe I’m saying that, but it’s true. 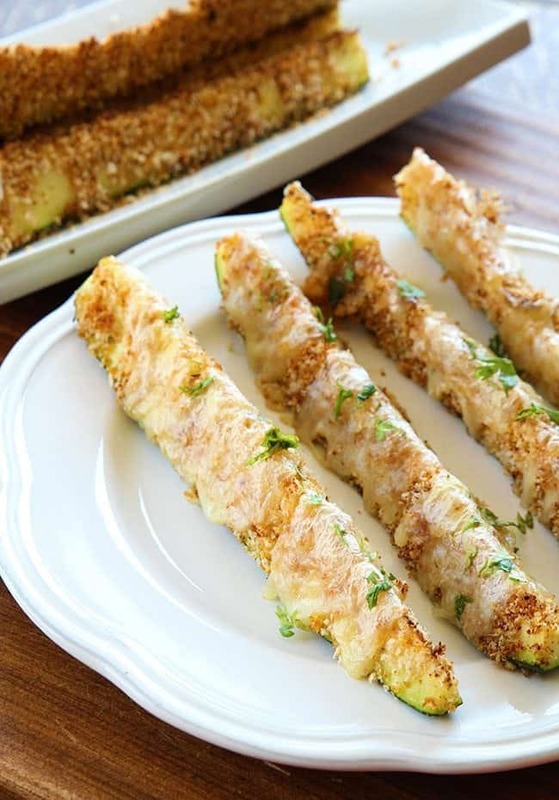 There’s something wonderful about how crispy, salty and delicious the zucchini sticks are without melted cheese on top and since you mix in Parmesan in the coating anyways, you don’t really have to add it. Then again..more cheese is usually not a bad thing. Happy cooking everyone! Let’s use up our summertime squash! 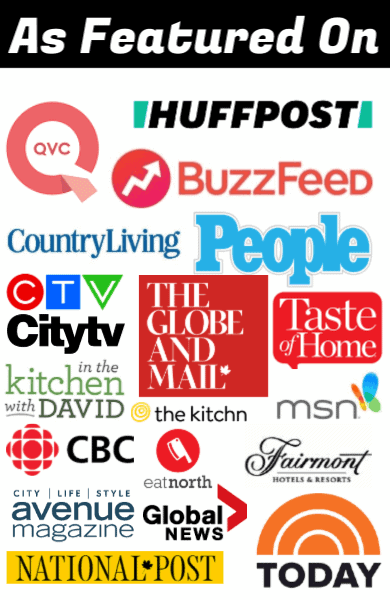 PIN THIS RECIPE to your VEGETABLE RECIPES Boards and Remember to FOLLOW ME ON PINTEREST! You've never eaten zucchini like this one! 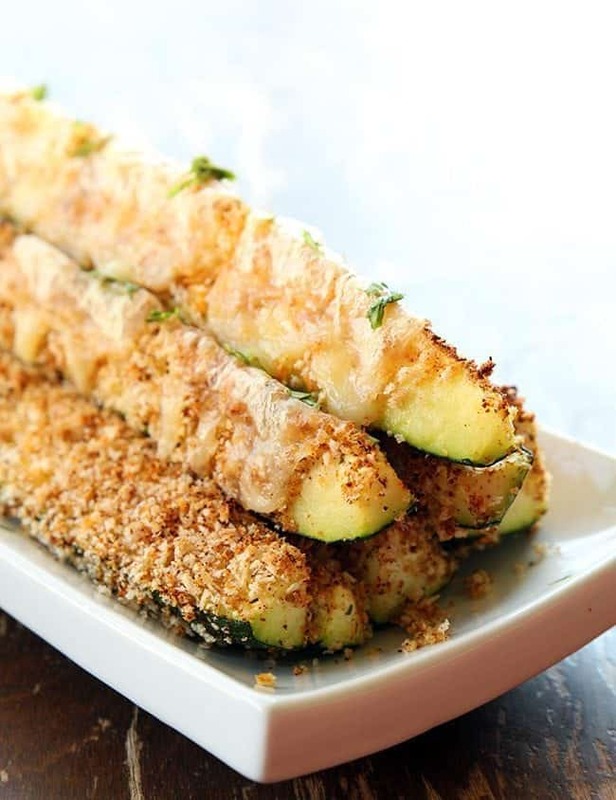 No oils used, just Panko, spices and cheese to make the most delicious, lower-fat zucchini sticks you've ever had! Slices of Havarti cheese if wanted. Combine the seasoning, Parmesan cheese and crumbs completely, then pour onto a plate. Beat the egg and pour onto a large plate. Dip each zucchini stick into the egg, coating all sides, then dip into the Panko, coating all sides. 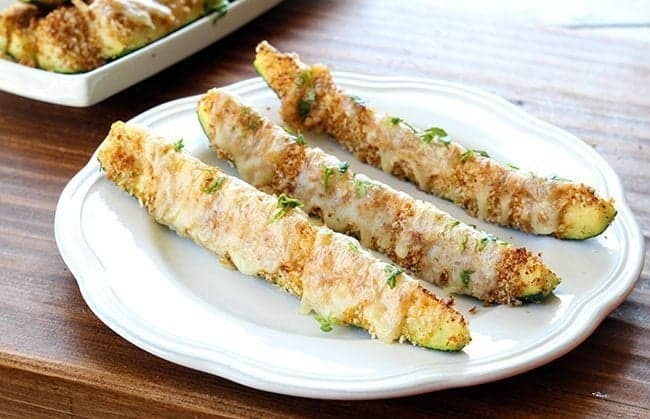 Place zucchini sticks onto a baking sheet. Pull out the zucchini, turn the oven to broil. Place the cheese on top of the sticks. These look amazing – thanks! Aw Dottie thank you so much for this! I know there are tons of you that print and run and I Iove you all for it! These types of comments are what keep going and give me such joy, I treasure every single one! I love hearing from all of you! They are delish! Such an easy way to eat veggies!